Firstly, I need to apologise for my prolonged absence from my blog. It's my first winter blogging, and I've found it really hard, from lack of sleep, work going completely crazy, losing my weekends constantly to helping my parents out at their business, as well as just going into winter hibernation mode. I know, terrible excuses, but there you have it. I've also had a bit of an off-moment with beauty, where I was feeling a bit rubbish about my skin being dry and blotchy, and then having the most godawful experience with some new products I used to try rectify it. Nightmare! I'm pretty sure this is also why I've not been as interested in the all the Christmas beauty specials out at the moment. Maybe it's just because I've not been feeling all that Christmassy lately, all the festivities have me feeling a bit 'meh' at the moment. Not that I don't enjoy Christmas, far from it, it's just that this year, the excitement seems to have missed me. However, one thing I always indulge in at this time of year without fail, is candles. The dark nights just call out to have a candle burning away in the background, and there are two that I picked up which have been putting some festive cheer in me. The first is Mrs Todd's Citrus and Cinnamon which I first read about on Ruth's blog here. It's a fairly traditional smelling candle to my nose, with citrus and spice notes through the main body of it, but with a little added depth from the musk note, and jasmine mixes it up a little by giving it a tiny bit of freshness. I think the jasmine note is a great idea because 1) jasmine is one of my favourite flowers and smells and 2) sometimes the whole citrus and spice scent is so common, it's nice to give it a little more edge. For £28, I think this is a lovely candle that still looks and smells luxurious, but without breaking the bank. The next one is probably the best candle I've bought in a long time. Feuilles de Tabac by Miller Harris is a wonderful mix of smoky, woody and green scents bundled together, with a slight church-y incense feel to it. I've never bought anything from Miller Harris before, but this definitely has me wanting to buy more. I much prefer this to the Diptyque Feu de Bois, because the fresh pine scent gives it a little more dimension, and stops it from being an overwhelmingly smoky scent. If you are happy to spend £40 and find yourself slightly put off by the Diptyque version, or are looking for something which smells slightly more sophisticated and layered, I really recommend this one. 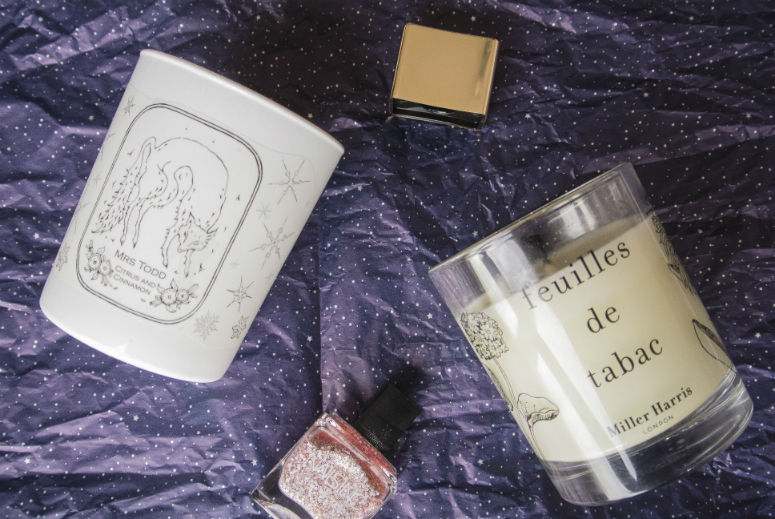 Are there any seasonal candles that you would recommend to get me out of my winter blues? Let me know in the comments! I've said it before, and I'll say it again: I adore serums and oils. I love it even more when you get a serum that is an oil, especially when it's been packed with so many good ingredients. Back in August I read an amazingly helpful review from the wonderful Kal from the Cluttered Closet about the Antonia Burrell Radiant Light Facial Serum, and for some reason, I couldn't get the thought of it out of my head. Something about the fact it was completely natural, packaged in a completely black glass bottle that meant business, and had rave reviews convinced me to buy it. The Radiant Light Facial Serum is a deep orange serum oil which includes Frankincense, Rosehip, and Carrot Oil amongst other things. The aim of this serum is to reduce scars and pigmentation, evening out skin tone, as well as whacking in moisture into your skin. The Antonia Burrell site gives a full list of ingredient which you can list up, but I'm sure most people who are interested in beauty will have come across something that has Rosehip in for its benefits. Frankincense helps protects your skin as well as assisting the Rosehip with scar reduction. To be honest, every single oil that has been included in this serum has some benefit to the skin, and you can tell that they have been carefully selected to create something amazing. I've been using this product religiously everyday since buying it back in August, both morning and night. It was a little bit heavy during the warmer weather, but I really didn't mind it at all. After using this, my skin immediately feels comforted and hydrated, so that feeling alone has been worth more than enough to spend a little time letting this sink in in the morning during those warmer times. The smell might not be everyone's cup of tea, but it's the kind of scent you should expect with something that's packed with so many natural ingredients, and personally, I find it kind of comforting. In terms of results, I think it has helped reduce my acne scarring, although since I get hormonal acne a lot, I keep getting new spots that need to clear up and heal while I've already got skin that is healing. What I have really noticed since introducing this into my routine is how much more moisturised my skin feels overall. I also think it has been helping to balance out the oily vs dehydrated parts of my face. I'm not quite even in that sense yet, but I've seen a huge improvement. This is my first product from Antonia Burrell, and I am so impressed with it, I can't help thinking that I should try some other products because I'm convinced they'll be just as fantastic. The killer here? The price: £58.80 for a dinky 15ml bottle. Ouch. Serums and oils have always been something I tend to spend more money on, simply because I think they are the powerhouse of my skin routine so I'm not actually that freaked out I spent so much money on it. Also, seeing just how much I rely on this product, and the fact that you only need one pump at a time, it's actually delivered on the value for money front, as there is just so much left in the bottle despite the fact I've been using at least two pumps a day for the past two months. I was actually really lucky that I managed to use a discount code for lookfantastic.com and bought it from there, saving myself nearly £20! Honestly though, I've come to love this product so much, I'd actually happily buy this again, even at full price. I think if you were really not keen on spending this amount of money, you could make do with the Pai Bioregenerate Oil, but personally, I've seen and felt much better results with the Radiant Light Facial Serum, so there's no doub tas to what I'll be repurchasing again! 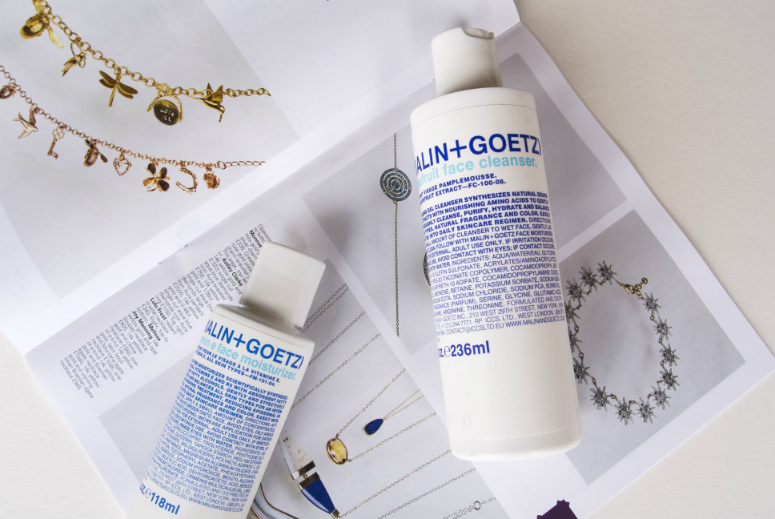 Do you think you will give this serum a go? Have you tried any other Antonia Burrell products? Let me know in the comments! 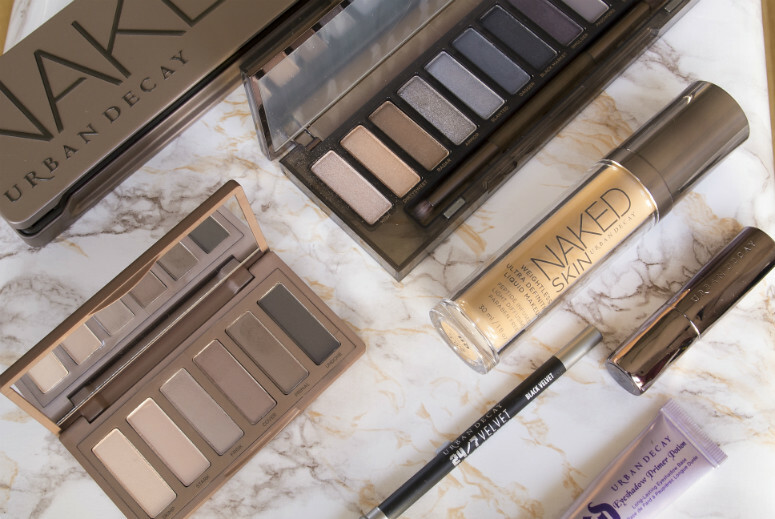 Recently, my makeup stash has begun to overflow, so in my efforts to try and rearrange my beauty bits and bobs (and generally failing), I've realised that I've kind of caught Urban Decay fever. This time last year, I had very little from Urban Decay. I'd used and liked the Primer Potion, and regularly used the Naked 2 Palette which I've had for some time, but not much else for a long while. Then they opened up their store in Covent Garden, and slowly but surely, it's been creeping its way more and more into my beauty cupboard. Their lipsticks which were raved about in lots of blogs last summer got my interest up, but it was actually visiting their store during my lunch break that gave me the time (and space) to swatch, and walk away with a lipstick. But, it was only really this year since August that the fever really got a hold of me. In fact, I can pin it to the exact date. 6th August. I know, I know, it might sound sad, being able to pin the date, but this was the day that lovely Heather from Porcelain Beauty hosted a meet-up and demo of the Smoky Palette at the store, and talked through all her favourite products that really got me interested. After buying the Smokey Palette, I've since gone back and invested in another eyeshadow palette, foundation, eyeliner and shortlisted a whole load of other things to try. I think the reason for it is the fact that Urban Decay have come such a long way from the garish bright colours that I always used to associate them with. Yes, they'll always be known and loved for their Naked palettes, but for some reason, for years I've associated them with vivid and scary pinks as well as electric blues for eyeshadows. They've really moved on in the past few years, and it's a great positive change, because their products can appeal to everyone across the board, no matter what kind of look they like. I still feel a bit unfamiliar with the brand, so would love to know which products I should prioritise getting. You can see pretty much all the UD products I've got right now, so let me know in the comments which things you think I should get next! I've been having a bit of a foundation funk lately, where nothing in my foundation stash has really been appealing to me, not even my usually reliable Chanel Perfection Lumiere. I've been ill for a while recently, and you can really tell with my skin, so I've been in need of something that covers or blurs any scarring or imperfections on my skin, without feeling heavy and cloying. It's funny how tastes change so dramatically. A little over a year ago, I would have said I only ever want to use really thick formulas when my skin was in this state, now I want something that I can't feel. Well luckily for me, the Diorskin Star Foundation is pretty much exactly what I need. 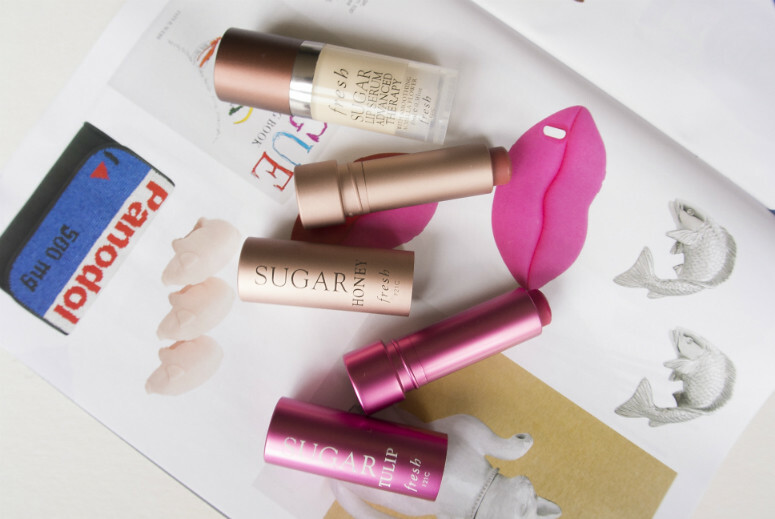 Lightweight but still very buildable, this foundation is a dream to wear. I did actually try this on last year as soon as it launched, and did like it, but didn't feel the need for it in my foundation wardrobe (or possibly because it came out around the time I usually have to buy all my family members birthday presents, I was kind of broke?). Now I know better. I should have invested in it straight away. 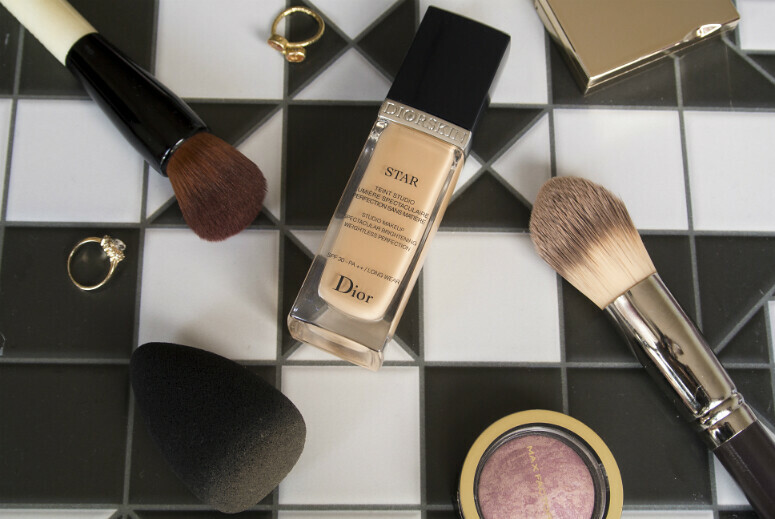 The formula for this foundation does apply really sheer on the skin when you dab with a light hand, giving the thinnest veil of coverage, or can be built up to blur out scars. It's very comfortable to wear, and at no point do I really 'feel' it on my face like I do with some of my other formulas. It also manages to still make me look healthy, which is kind of amazing considering I've been so under the weather. I feel like my skin sort of gives off an actual glow, but somehow it manages to semi-mattify everything so I don't look like a glaring lightbulb at the end of a working day. Even skintone, good coverage, lightweight, and so natural looking, I really see myself making sure I always have a bottle of this in my makeup drawer. I also decided to give a different sponge applicator a go, investing in the Dior Backstage Blender which is a definite step up price wise from my Real Techniques sponge, and also a real step up in terms of quality. Comparing the two, the Dior version is much denser and more solid, which you can really tell when you squeeze the two to see which one compresses more. I also think that the Real Techniques one absorbs too much product which ends up wasted. I've been told that the Backstage Blender has been made with a more solid internal core, with only the outside part of the applicator being porous, and after using it, I think this probably is the truth rather than marketing spiel. Anyway, I am so glad I've been using this, because it makes applying foundation really easy to use, and the finish looks a tad more even than with a brush. If I were using a brush, I'd probably finish off with the sponge anyway, so it makes sense for me to just go in with this one. I have been seriously loving using this sponge, I've actually not used a brush once since I got it. Less washing for me to do at the end of the week, win win! Conclusions here are that if you are looking for a foundation that can make you look like the picture of health with 8 hours sleep a night, then this is the one for you. If you want it to get a much more even and smooth finish, or are just looking for a new applicator, then investing a little bit more in the Backstage Blender is something I won't hesitate to recommend. Time to celebrate the end of my foundation love dry-spell, I'm all starry-eyed over this one. The cooler months have people reaching for their knits in England, and nothing beats the comfort of cosy cashmere. There's something to be said about pulling on that cashmere jumper or wrapping yourself in a cashmere scarf that brings a little sophistication along with that snug feeling. 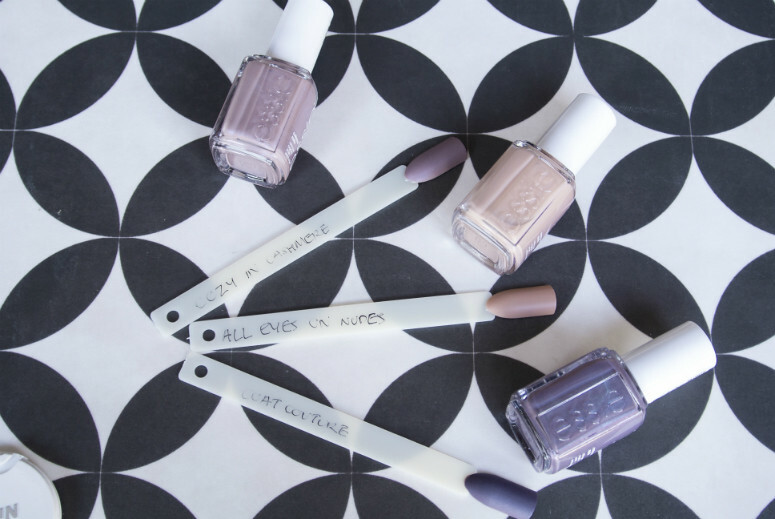 Essie, very aptly, have brought out a collection that sums up the cosiness of cashmere, both in the colour and texture. The Essie Cashmere Matte collection features six very pretty shades that all dry out to a matte finish, but there's something rather unique about them that has sort of converted me to matte nail polishes. I'll admit, my first encounter with matte nail polishes (OPI's You Don't Know Jacques) several years back was accidental, and I really didn't like the finish. I found it too weird, and just far too flat for my liking. With the Essie Cashmere Matte collection, this is completely avoided somehow, which has really surprised me. The colours either have shimmer running through them, making them duochromatic, or if they don't have shimmer, somehow really glowy looking. I made use of a 3 for 2 offer in Boots on all Essie polishes and picked up: Cozy In Cashmere, a greige-taupe that turns purple in certain lights because of the blue shimmer, All Eyes On Nudes, a lovely café-au-lait colour, and Coat Couture, a mauve-grey hybrid. These colours are all stunning. I am absolutely in love with Cozy In Cashmere, it looks so pretty on. I thought Coat Couture would be my favourite, but Cozy In Cashmere has completely stolen its thunder. I didn't expect to like All Eyes On Nudes so much, because I was worried it would be too flat on the nail, but it really does exude that strange glowy quality I talked about, it just looks perfect on and is that wonderful caramel-y shade I've been looking ages for! Such pretty colours, gorgeous colour effect, and glowing quality, there has to be a catch right? Yep, I'm afraid so. My recent purchases from Essie have vastly improved in longevity, but my encounter with Cozy In Cashmere just didn't work out that way unfortunately. A little streaky to apply, and only 3 days before major, and I mean major, chipping ensued. Chunks out of it. Not a great performance there, which is such a shame because I adore the colour. It's possible that this happened because I didn't put a top coat on, but I only have shiny or gelly topcoat in my collection, and that would completely defeat the point of wearing a matte polish, right? Oh, the dilemma! I think I can get away with painting a shiny topcoat over All Eyes On Nudes, but I rather like the matte effect of the other two colours. If anyone can give me suggestions on what I can apply over the top to keep these on my nails for longer, send them my way immediately! The colours in this collection are just so pretty, that I'm sorely tempted to buy some of the remaining ones in the collection, but the longevity issue is really holding me back from committing to the collection fully!